cap is up to 35 cm broad, convex, reddish to yellowish brown, smooth but often uneven. 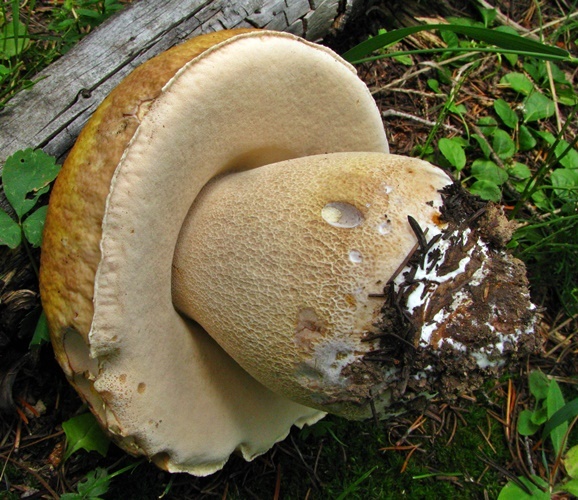 underside of cap consists of pores that are initially whitish, then olive in age. flesh is white; flesh and pores do not discolor when bruised. stem is white or slightly brownish, variable in shape, and is marked by a fine, white fishnet pattern that extends down from the top of the stem. grows singly or as many in conifer and hardwood stands. has a mild and pleasant taste with no odor; cook before eating.